It’s out! Anoth­er land­mark day in the Cre­ative world. 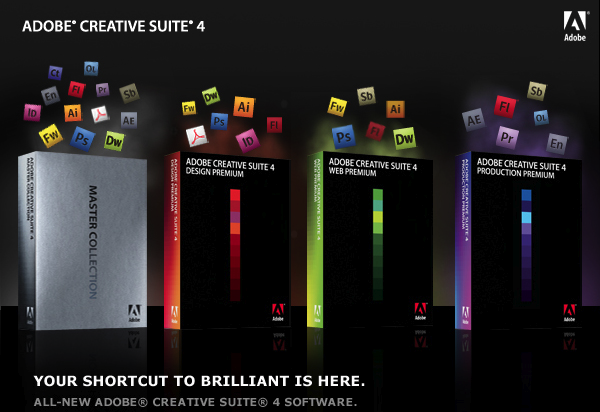 Adobe Cre­ative Suite 4 is ship­ping and in-stores ear­ly this morn­ing. Adobe also announced that for a lim­it­ed time, own­ers of: CS2, CS1, Macro­me­dia Stu­dio 8, Stu­dio MX 2004, or Pro­duc­tion Stu­dio will qual­i­fy for up to $200 on eli­gi­ble upgrades to CS4. This spe­cial offer will last till Feb­ru­ary 28, 20091. You are currently browsing the Just a Memo archives for the 'dreamweaver' tag.